There is an empty land next door. Last September it was priced 66 lakhs (some 4.5+ grounds as a single plot). Yesterday, I learnt that it is valued 1 Crore and 7 lakhs. Both the times, I didnt care much, coz I knew I wasnt going to buy it. But, Whew ! Can you Imagine ? Land prices are at all time high in Chennai, even at remote places like Villiwakkam. Think about Besant Nagar.. Square feet prices are approaching Rs. 10,000 /-. Thats like Mumbai, Yo ! 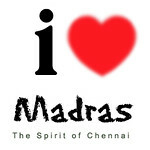 People are approaching the out-skirts of Chennai, and investing on Lands, with the hope that the city will expand. And the City does expand. By and far, few years from now.... land prices will tease you with a grin. Better buy a land now, if you want one. Indian soil just got little more precious. Indian soil just got little more precious..."ellam ungalaala" !! Just kidding:-)..but,it was one of the reasons told to us by a builder!! Reason, I want to manage it myself and not worry about our stupid rent control act and the thondar gumbals.!! i was aghast to find that the prices in navalur was 15-20 lakhs per ground. i want to see those blokes who are keen to buy in navalur - which is not chennai even by pincode. koncham wait panu keerthi when this boom ends u can buy things for cheap. same thing appened in cbe. ppl were buying like crazy with all the black money during 91-96.
then cbe bomb blast and nobody was buying. i gt some land for cheap. its a diff story now. for now, save some money and wait for the fall. avlo daan solluven.